Sensational. Stunning. Sublime. Snagit is so close to perfect that it's near impossible to pick fault with it. If you spend any time take screenshots or recording screen activity, this is the program for you. When taking a screengrab requires nothing more than hitting the Print Screen key, and when Windows 10 even has its own built in screen capture tool, you may well wonder why on Earth you would want to spend money on software for taking screenshots. Snagit 2018 is the answer. Snagit will not only grab everything that you can see on your screen, not only individual windows, not only videos of on-screen activity, but much more – including grabbing scrolling screenshots of long web pages, and grabbing text from screenshots to boot. The inclusion of an image editing component is nothing new for Snagit, but the latest edition of the program also includes tools that makes it possible for you to rearrange the components of the images you grab. At its most basic, Snagit is a screen capture tool that lets you use a custom keyboard shortcut to grab everything you can currently see. Alternatively, you can use the horizontal and vertical grabbing to capture the full contents of a scrolling window. There's even a delay timer so you can prepare your shots before capturing them. 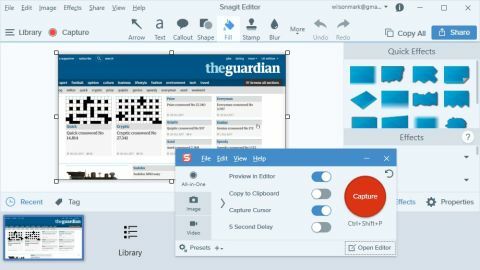 The image and video capturing side of Snagit is impressive and incredibly simple to use, but there are robust editing tools on offer as well. Snagit might never replace your dedicated image editor, but the range of tools it offers for working with screenshots is very impressive. Image editing isn't just about enhancing your grabs; you can also augment them with annotations, shapes and other objects. This is all very impressive, and combines with Snagit's excellent video capture tool to give it a real edge over other screen grabbing tools.